that You Can Use Today! In today's world of investing, the selecting equities to place in a portfolio is a nightmare. There are thousands of investments to choose from and multiple investment vehicles such as mutual funds and Exchange Traded Funds (ETFs). And the portfolio must be designed to match the risk tolerance of each investor. As a result, each portfolio is a customized creation and the design process is filled with subjective human judgments. This all changes in the world of Dynamic Investments as discussed on this page. As explained on this site, and in more detail in The Amazing Future of Investing book, Dynamic Investments are standardized portfolio products. Each has the goal of finding uptrending equities and buying them while selling or avoiding those that are trending down. This is a universal goal for all investors. They don't care about the risk tolerance of any investor. As a result, each DI is an investing "product" that can be bought off-the-shelf from a variety of vendors. And they can be sold via DI Designer Catalogs such as the one shown below. The Productization of Investing is the Holy Grail of the financial world. Financial mavens have been searching for it for decades. They haven't found it. In Dynamic Investments, the NAOI has. The NAOI has designed several Dynamic Investments that we offer for licensing. Each is designed to search different areas of the market for uptrending Exchange Traded Funds (ETFs). And each is optimized by the designer who defines the variables discussed on this page. These are DIs that can be used today! Following is the NAOI Dynamic Investment Catalog as of August, 2018. Note that the Chapter References are to areas in book entitled "The Amazing Future of Investing" that can be purchased in the NAOI Store. It must be noted that each DI can serve as a standalone portfolio OR as one building block of a Dynamic Portfolio as discussed on this page. The information shown in the catalog menu is discussed next. There are an unlimited number of Dynamic Investments that can be created for a full spectrum of goals. To add structure to the development process the NAOI has defined the DI Categories shown in the Catalog. Categories are describe briefly below and in more detail in the book The Amazing Future of Investing. This category of DI rotates between multiple asset classes based on a periodic sampling of market trends. This category is most appropriate when using DIs as a standalone portfolio. DIs in this category rotates between ETFs that focus on a specific asset class such as Stocks for example. A Stock-Focused DI will rotate between various stock "types" such as Small-Cap, Large-Cap, Growth and Value for example. 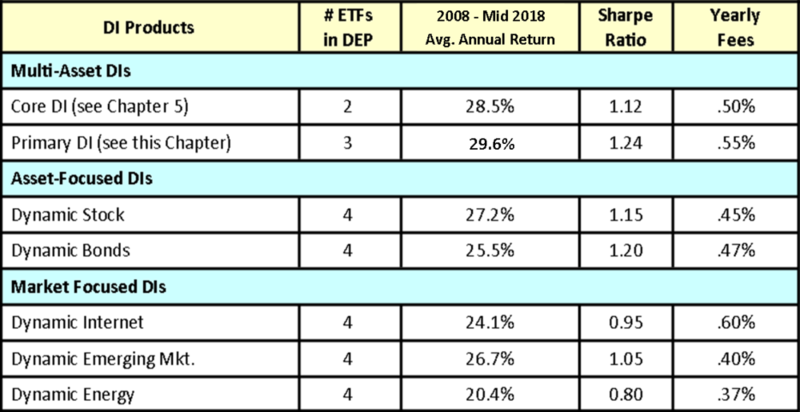 A Stock-Focused DI will also hold in its Dynamic ETF Pool at least one Bond ETF as an "escape valve" that is automatically purchase by the DI when stocks, as a whole, are trending down in price. DIs in this category are typically used as Dynamic Portfolio building blocks. DIs in this category rotate between ETFs that focus on a specific market or market-segment. An example would be an Internet-Focused DI. Such a DI would rotate between multiple-ETFs that track Internet indexes with both a Stock and a Bond ETF as "escape valves" that will be selected when ETFs tracking the Internet are moving down. DIs in this category are typically used as Dynamic Portfolio building blocks. Note that the "escape valve" concept is explained fully in The Amazing Future of Investing book. Because DIs are standardized products as opposed to customized creations (as are MPT portfolios), performance data can be shown for each in the DI Produce Catalog. This benefit of the investment "productization" enables investors to make informed choices that they are not able to make today. The ability to present Dynamic Investments, and thus total portfolios, in catalog format has wide implications for the world of investing. In fact, it changes virtually everything. The DI Product Catalog shown above is an example. Please contact NAOI President Leland Hevner at LHevner@naoi.org for the current one.